Of course you want fudge in almost any flavor you can think of, or maybe you want other classic treats like taffy, soft-serve, candy, caramel apples, etc., but you're probably too busy eating what might be the world's best food: chocolate-covered bacon! 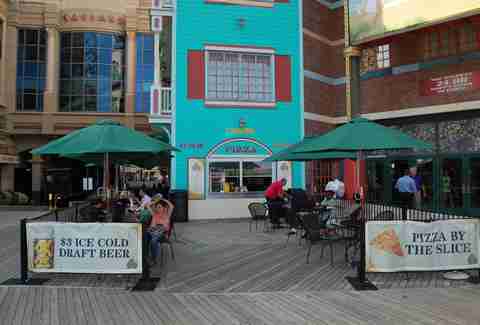 This small grease pit located to the left of the Bally’s entrance has some of the best deals on some of the worst food for your waistline: $1 hot dogs, $3 drafts, and pizzas by the slice. Picture a made-from-scratch chocolate cupcake baked with toffee, filled with Oreo cookies, and topped with Reese's icing. Or a chocolate cola cake with Jack Daniel's, caramel, and ganache. Or dozens of other awesome creations from Caesars' Pastry Chef Deborah Pellegrino. Now picture yoursel... oh never mind, we had you at whiskey. 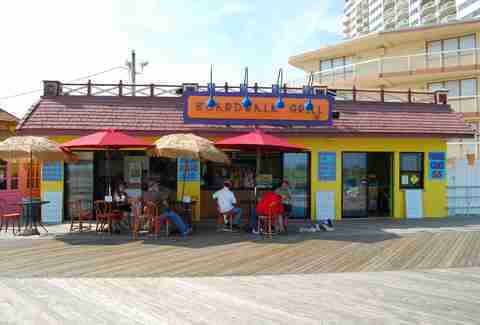 It looks like a tiki hut hybrid, but it houses huge house-made egg rolls and crab cakes. Not feeling like real food? 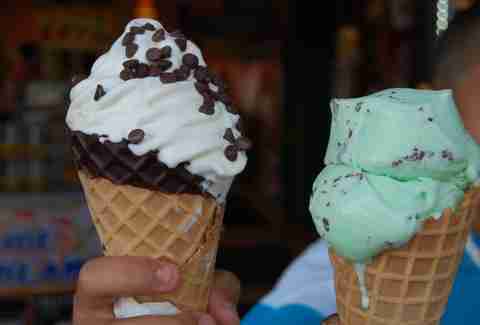 Then you can have some soft-serve ice cream, not-soft-serve ice cream, water ice, and funnel cakes. Cash only! 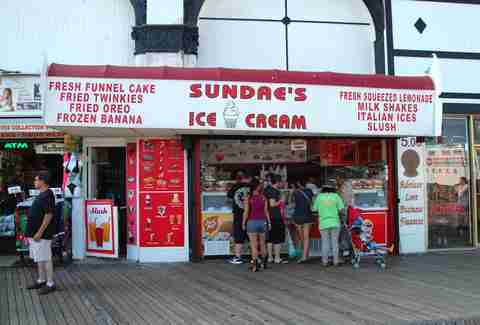 The sign says it's an ice cream spot, and sure, they do have almost any flavor of ice cream you can think of (plus waffle cones), but they also have gyros, fried pickles, fried Oreos, deep-fried candy bars, and last but not least, funnel cakes. 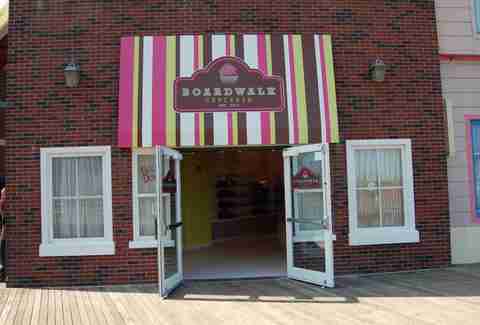 There must be a reason AC is called “Salt Water Taffy Capital of the World”, and this place, which claims that there is “sea air and happiness sealed in every box”, might be it. Of course it might also be the reason you just stuffed yourself full of things like fudge, macaroons, chocolates, and peanut butter chews, too. 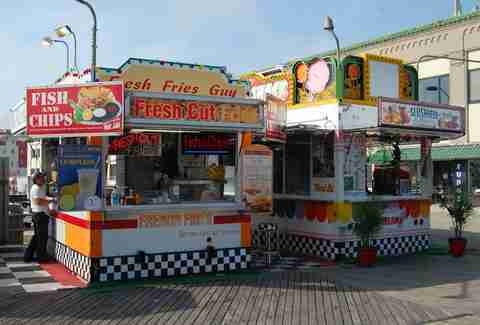 What happens when two awesome food stands almost become one? You get French fries with cheese, corn dogs, fish & chips, and lemonade on one side... and slushies, water ice, and soft-serve sundaes on the other. Oh, and you also get pretty fat. 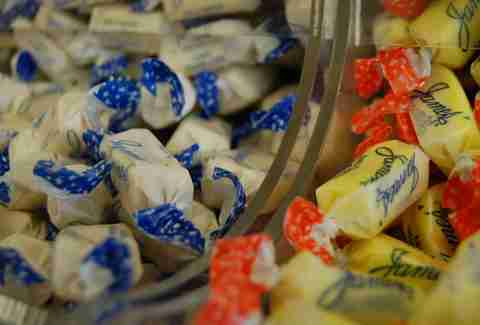 If you’re looking for a place to OD on sugar, welcome to white crystal paradise. 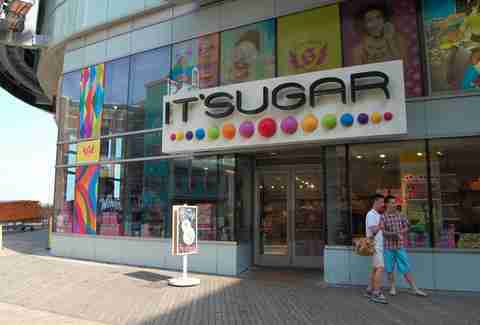 They've got hard candies, gummy worms, Sour Patch Kids, gum balls as big as your head, Pixy Stix, jelly beans, candy sculptures, walls of PEZ dispensers, and... an adults only section? Yup. 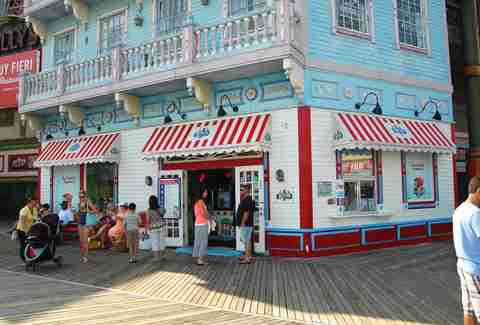 James' is the other fantastic place on the boardwalk to get your taffy fix (and great gelato, too). 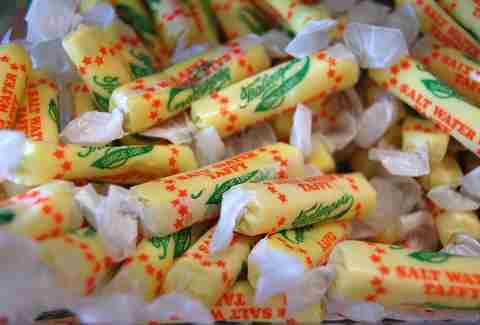 Plus, they offer a 30-40 minute candy-making tour for $5 so you can see how the salt water taffy and caramel are produced in the plant behind the store. This 65-year-old family business apparently uses a “secret family recipe” -- hand-squeezed fresh fruit and filtered water with no preservatives or additives -- to make refreshing, brightly colored ices in classic flavors like lemon, cherry, and pineapple, obviously. 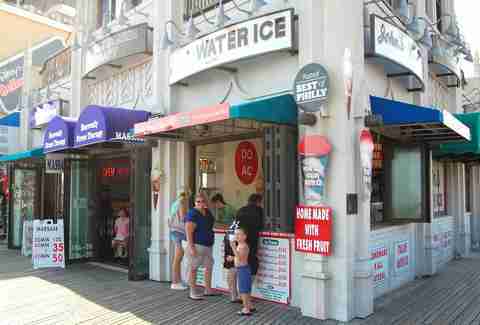 Oh, and just in case you were jonesing for some Philly-style water ice, there's a sprawling store on the boardwalk with multiple windows (no wait time!) ready to brain-freeze your face off in no time. 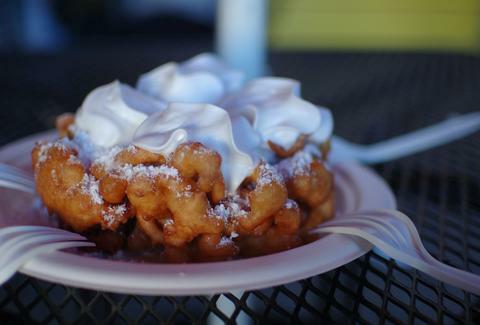 Deep-fried everything: dough (in the form of funnel cakes), Twinkies, Oreos, frozen bananas, Reese’s, Snickers, s’mores, cookie dough, Rice Krispies, etc. 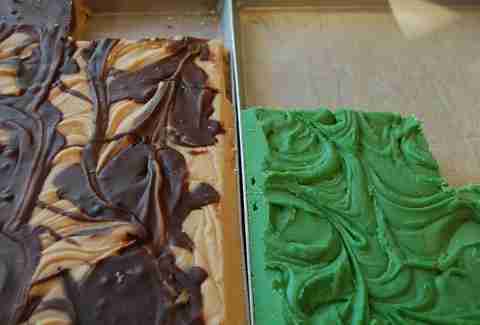 Oh, and "healthy" stuff like gelato. Another one-stop shop for things like fried cannolis, zeppolis, waffles, ice cream, chocolate-dipped strawberries, fried Oreos, cotton candy, and more. 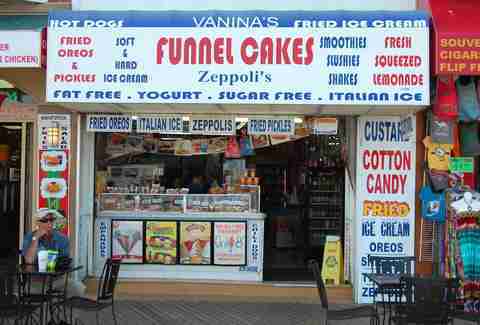 But Vanina's true specialty is funnel cakes, which come in flavors like cinnamon, strawberry, or chocolate and give you yet another reason to actually hit the boardwalk.